How much difference, in terms of ballistics, is between the 270 Winchester, 270 WSM and 270 Weatherby? The 270 WSM is 5.2″ low at the same distance. The 270 Weatherby Magnum is 4.9″ low at the same distance. Between the 270 Winchester and 270 Weatherby Magnum, the difference is only 1.6″. Under typical hunting conditions this difference is not noticeable. And remember that most shots are taken under 200 yards at deer. IF you shoot on the open plains where distances of 400+ yards is the norm, then using a WSM or Weatherby in 270 cal makes more sense. But for most hunters the 270 Winchester does the job, and without excessive muzzle blast, recoil, etc. Which Bullet Produces the best ballistics in the 270 Winchester for Whitetail deer? For whitetail deer 270 bullets in the 130gr weight class not only have a high ballistic coefficient but shoot accurately in many different firearm makes/models. This combination, when pushed at velocities near 3000 fps makes the 270 Winchester produce ballistics that is ideal for long range shots at deer (300 yards plus). If hunting larger sized deer like elk you should consider a tougher constructed bullet of 150grs and above. Barnes, Woodleigh and Fail Safe bullets are good examples. Handloaders – Which Powder produces the best ballistics/accuracy for the 270′s? Slow burning powder such as IMR4350 (Mulwex-Thales AR2209) consistently produce accurate loads at safe working pressures in the 270 family of cartridges. How do I sight-in the 270 Winchester for optimum downrange ballistics? Select a 270 factory load (or enter your favorite handload). In our example, let’s select a Winchester 130gr Silvertip. Now let’s optimize this load for you firearm…..
That 130gr Winchester load is best sighted-in 2.49 inches high at 100 yards for a 240 yard zero. Point blank range is at 284 yards – this means you can use your 270 and this load to shoot a deer holding dead-on (never high or low) all the way out to 284 yards. Download Shoot! 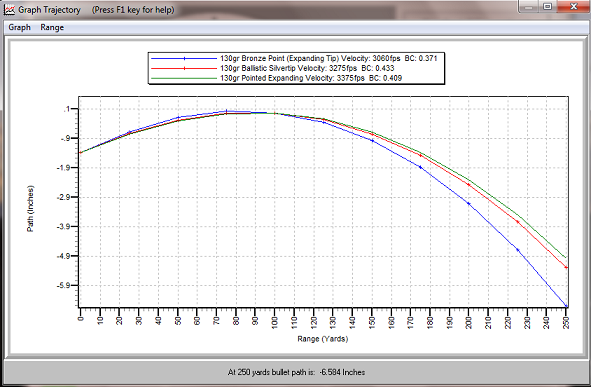 ballistics app/software today to do more calculations like this for your 270. The 270 Winchester is still popular among hunters who shoot at game the size of deer and elk out to 350 yards. The 270 Winchester, although producing ballistics a less impressive than the 270 WSM and 270 Weatherby Magnum, is still preferred by many hunters. Firstly, its recoil is much less compared to the other 270′s. Secondly, the 270 Winchester is an inherently accurate cartridge and most standard off the shelf 270 firearms from various manufacturers shoot MOA groups or less without major modifications like bedding, floating barrel, chamber work, etc. 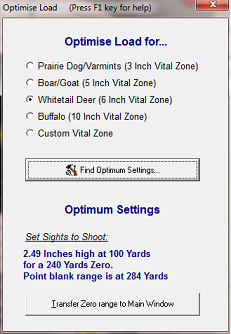 Thirdly, its only about 200fps behind the 270 WSM shooting a 130gr bullet – but you won’t notice this difference under field conditions unless you’re consistently shooting out to 500 yards (average distance shooting at whitetail deer is under 200 yards). The 270 Winchester, although producing less impressive ballistics, in reality has all the downrange ballistics performance hunters require to make the shot 99% of the time. There are 100′s of factory ammunition and bullets for handloaders in 0.277″ (270 cal) to search from in the Shoot! ammo/bullet database. Shoot! makes it easy to understand 270 ballistics.